Iron Banner is coming to Destiny 2 on PC for the first time. Running from November 21 until November 28, 2017, Iron Banner is available for all Guardians who've completed the single-player campaign. To access it, you need to visit A Place We Don’t Want to Spoil (the one that unlocks when you've completed the campaign), stop by our old pal Lord Saladin, and pick up the Iron Banner Quest. The Iron Banner playlist will then be available via your Director next to other Crucible modes. This time it’s Clash, which is Destiny 2’s most simplistic 4v4 deathmatch mode. Any reputation tokens you pick up along the way can then be turned in to Saladin and put towards your reward. This will be your final opportunity to grab the Season 1 Iron Banner emblem and shader (Radegast)... which means it’ll be PC players’ only opportunity, as this is the first time the competitive mode has been available since the shooter launched on PC last month. 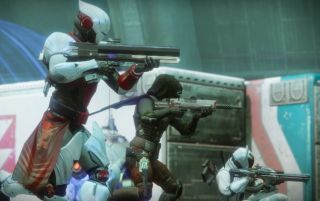 In our Destiny 2 review we awarded it a 85, stating: "Destiny 2 is a very well-made shooter and one of the best co-op games on PC."